The EPIMIC team focuses on the long-term impact of pathogenic bacteria on health. We study the molecular basis of persistent bacterial infections, as well as the epigenetic consequences of these infections on host cells. This research aims to find new ways of treatment against recurrent infections, and against bacterial imprints that may contribute to the genesis of chronic and complex diseases, such as cancer and autoimmune and metabolic diseases. Our model is the facultative intracellular bacterium Listeria monocytogenes, which, like viruses, has developed highly sophisticated mechanisms to deregulate and exploit signaling pathways in mammalian cells. It is noteworthy that several of these signaling pathways are also involved in carcinogenesis and other adverse health effects. Thus, through the study of Listeria, we can highlight the function of human proteins, whose deregulation could lead to both infectious and other diseases. The pathogenicity of Listeria monocytogenes is related to its ability to invade different types of cells, including epithelial cells of the intestine, liver, brain and placenta. When it reaches the cytoplasm of these cells, L. monocytogenes proliferates and uses the force of actin polymerizationto move into the cytosol and spread to neighboring cells. This phase allows Listeria to disseminate in the tissues of the body. Using an in vitro experimental model of long-term infection in human epithelial cells, we have shown that after 2-3 days of infection in hepatocytes and placental cells, L. monocytogenes switches from the active cytosolic lifestyle to a quiescent vacuolar lifestyle. Bacteria cease to produce ActA (the protein that triggers actin polymerization at the bacterial surface), and cytosolic bacteria are engulfed in lysosomal vacuoles (Listeria-containing vacuoles, "LisCVs"). Subpopulations of vacuolar bacteria survive as slow/non-replicating forms, which retain the ability to reactivate as disseminating forms. In the absence of ActA, bacteria can even parasitize host cells in viable but non-culturable (VBNC) state, which renders Listeria undetectable on standard agar plates used in clinical microbiology (Kortebi et al., 2017). These results reveal the ability of Listeria to generate intracellular persistent forms, which could be asymptomatically carried in humans or animals in the long-term. We found that Listeria targets the human protein BAHD1 (Bierne et al., 2009) and showed that this chromatin-bound factor defines a novel histone deacetylase repressive complex involved in epigenetic regulation. BAHD1 acts by tethering chromatin regulators (MIER1, HP1, MBD1, KAP1) and chromatin-modifying enzymes (HMT and HDAC) to sequence-specific transcription factors, enabling local chromatin compaction (Bierne et al., 2009)(Lebreton et al., 2011). 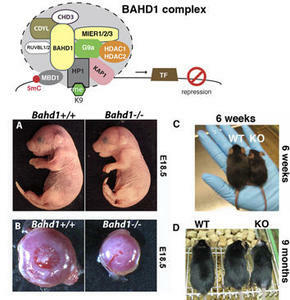 BAHD1 controls placental development and cholesterol homeostasis (Lakisic et al., 2016) and plays a role in bacterial infections (Lebreton et al. 2011, Lebreton et al, 2014). In addition, we provide evidence that BAHD1-mediated heterochromatin formation could be linked to DNA methylation and may contribute to the spatial architecture of the genome (Libertini et al., 2015). © H. Bierne, Institut Micalis, INRA, Jouy-en-Josas; INRA-ICS, CNRS/Inserm/Université de Strasbourg. Upon signaling induced by L. monocytogenes infection, the BAHD1 complex represses a set of immunity genes induced by interferons (particularly, Type III interferon or IFN lambda) in epithelial cells. When bacteria secrete the protein LntA, this factor prevents the action of BAHD1 in the nucleus and selectively activates interferon-stimulated genes (Lebreton et al., 2011). LntA interacts directly with a central proline-rich domain of BAHD1 via a surface patch of conserved positive charges. Two lysines within this patch are required for LntA function (Lebreton et al., 2014). These results show that a bacterium can fine-tune the expression of immunity genes by controling negatively or positively the function of an epigenetic regulator. LntA is a paradigm for the emerging class of bacterial effectors entering the nucleus and hijacking nuclear processes, termed “nucleomodulins” (Bierne and Cossart, 2012). Studying nucleomodulins can generate new insights into long-term impacts of infectious diseases. Our work now aims to characterize epimutations induced by these factors and by other bacterial stimuli, and to investigate whether these “patho-epimutations” reprogram host cells. This research has been supported by INRA, the French National Research Agency (ANR), the Ligue de Recherche Contre le Cancer and the iXcore Research Fundation.